The immigration showdown between Congress and the White House is fully underway. In a press conference Friday morning, House Speaker John Boehner (R-Ohio) slammed President Barack Obama yet again and vowed that his chamber will move to thwart Obama’s new executive actions on immigration reform. In a primetime address the previous night, Obama unveiled his plan to unilaterally reform the US immigration system after Congress could not move a bill. Among other things, the new executive actions aim to shield millions of undocumented immigrants from deportation. Boehner has repeatedly warned Obama’s executive order would “poison the well” and kill any hope of comprehensive immigration reform legislation advancing through the House. 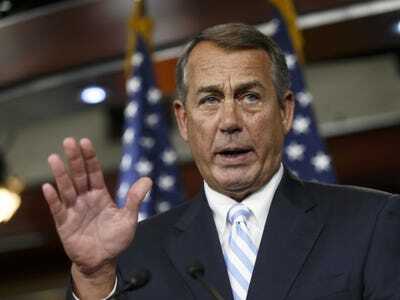 Boehner reaffirmed that position at his Friday press conference. Boehner also vowed that the House will do what it can to undermine Obama’s new executive action. “President Obama has turned a deaf ear to the people that he was elected — and we were elected — to serve. But we will not do that. In the day’s ahead, the people’s House will rise to this challenge. We will not stand idle as the president undermines the rule of law in our country,” he said. However, Boehner would not outline what specific actions the House will take on the issue. “We’re working with our members and looking at the options that are available to us. But I will say to you: The House will, in fact, act,” he told reporters after his statement.